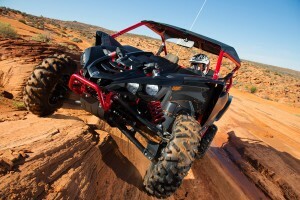 In August 2015, Yamaha introduced the YXZ1000R to the media, their dealers, and a live, worldwide audience. 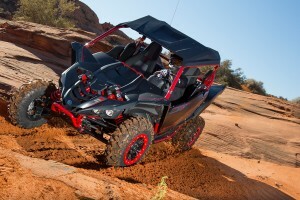 Now in its second year, Yamaha is offering four different versions. 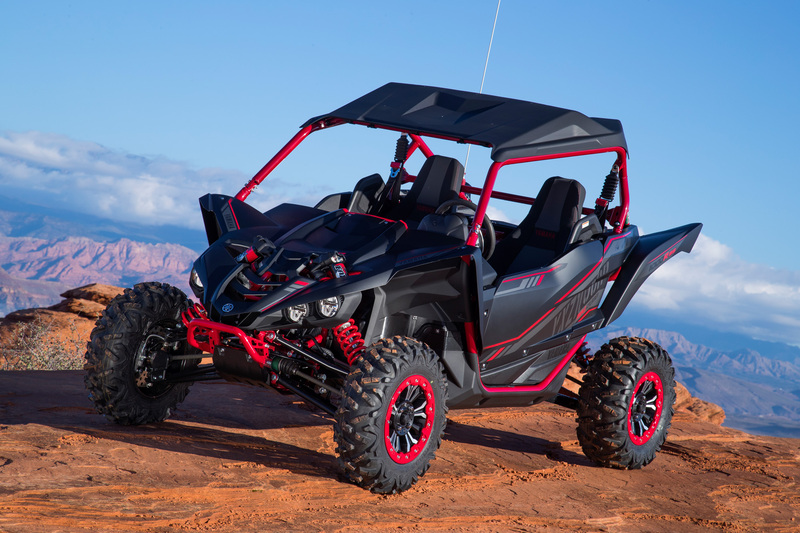 First, there’s the original YXZ100R, a unique addition to the side-by-side market with its manual clutch, five-speed transmission, and screaming top-end focused, 998cc, triple-cylinder engine. 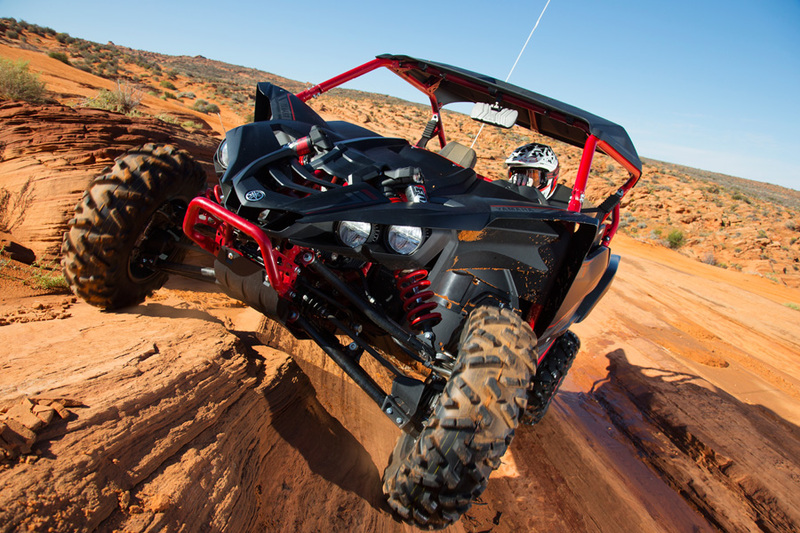 One year later, Yamaha released the 2017 YXZ1000R SS or Sport Shift. 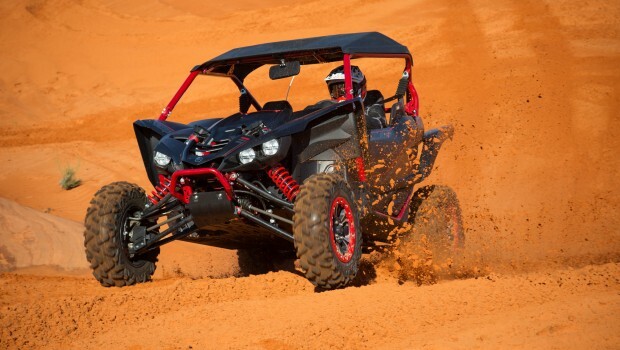 While it shares the same engine and transmission with the original YXZ, the SS features paddle shifters and a computer controlled auto clutch allowing you to work the gearbox without removing a hand from the steering wheel, or worrying about regulating a clutch. SS downshifts if it absolutely needs to in order to protect the clutch. To help conquer tough, slow-speed obstacles, Sport Shift features Dynamic Clutch Engagement in first gear. 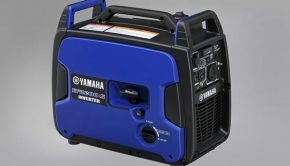 It allows the engine to rev up before quickly dumping the clutch creating a burst of power to take-off on hills or power over rocks and logs. Sitting still, Launch Control allows you to rev the engine and dump the clutch for drag racing or hill shooting. Sport Shift is easier to deal with for beginners, is less fatiguing, and for many, arguably, more fun to drive. True beadlock wheels at all four corners add strength and will keep the tire on the bead in case of a flat. 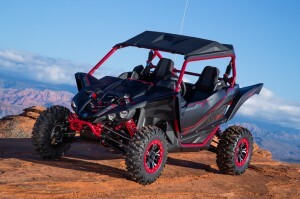 Yamaha is also offering Special Edition versions of both the standard and Sport Shift Models. Visually they stand apart with their matte black painted body work, embroidered seats, and true beadlock wheels. We typically don’t care for shiny black plastic because it shows scratches so easily. We also don’t typically love painted plastic, as it’s more expensive to replace in the event of a roll-over. With that said, matte finish painted plastic doesn’t scratch as easily as unpainted plastic, so painted plastic was the right way to go for longer lasting good looks. True beadlock wheels at all four corners add strength and will keep the tire on the bead in case of a flat, helping ensure you’re not stuck out on the trail. Forged aluminum rear knuckles reduce the amount of unsprang weight by 4.4 pounds per side. Less unsprang weight results in better suspension action. Externally, the X2’s offer a plethora of adjustments including preload, spring crossovers, plus high and low-speed compression and rebound adjustments. While suspension travel numbers remain the same on the 64” wide car with 16.2” front and 17.0” rear, the biggest upgrade to the Special Edition are its Fox 2.5 Podium X2 shocks. Externally, the X2’s offer a plethora of adjustments. Their compression and rebound pistons are located at the top of the shock where its high and low-speed compression, and high and low-speed rebound adjustments are located. 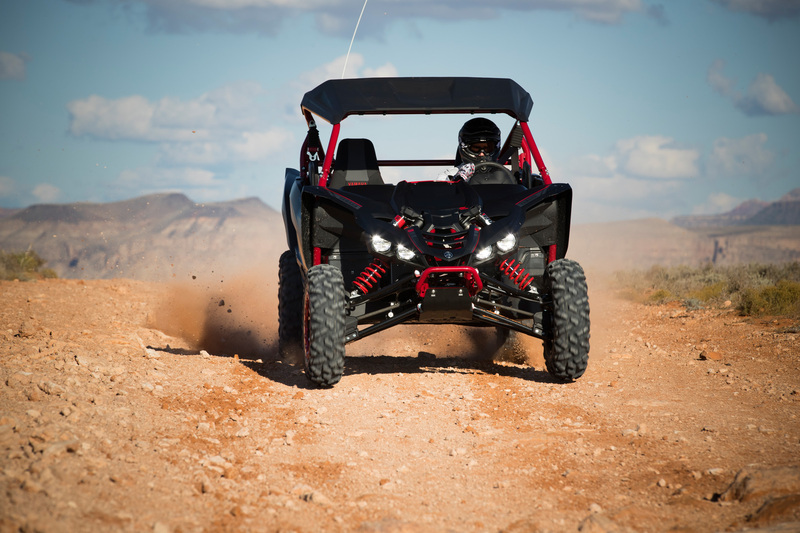 Separate high and low-speed damping adjustments allow you to tune the way the shocks dampen and recover from small, high-speed impacts from things like roots and rocks, separately from slower speed, crushing impacts from things like jump landings and G-outs. Like the progressively wound springs found on the YXZ and YSZ SS, the dual rate springs on the YXZ SE are designed to provide a plusher ride over small bumps ramping up to the stiffer main spring providing bottoming resistance. An adjustable cross-over on the SE’s X2 shocks allows you to change the point at which the load is transferred from the lighter tender spring to the heavier main spring. Keep the load on the tender spring longer for a plusher ride over smaller bumps or increased weight transfer in corners to improve traction. Transfer the load to the main spring sooner for flatter cornering and improved bottoming resistance. There is also the usual spring preload found at the top of the spring stack, affecting ride firmness and ride height of the vehicle. Bypass holes are designed to provide a suppler ride higher in the travel. When the main piston has traveled beyond the bypass ports, the shock fluid is restricted to traveling through the compression or rebound pistons at full force providing bottoming resistance and controlling kickback. The shim stack on the main piston is relegated to handling high-speed blowoff at extremely high-speed velocity helping prevent mid-stroke harshness. 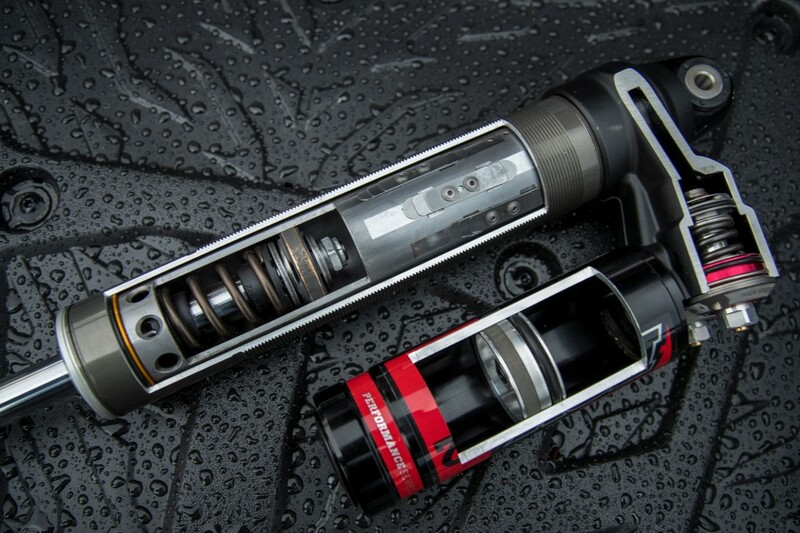 Internally, the shocks feature a dual inner and outer chamber design. Separate compression and rebound internal bypass ports allow some oil to bypass the compression and rebound damping pistons by flowing from the inner to the outer chamber on the compression stroke and from the outer to the inner chamber on rebound. The bypass holes are designed to provide a suppler ride higher in the travel. When the main piston has traveled beyond the bypass ports, the shock fluid is restricted to traveling through the compression or rebound pistons at full force providing bottoming resistance and controlling kickback. The shim stack on the main piston is relegated to handling high-speed blowoff at extremely high-speed velocity helping prevent mid-stroke harshness. The combination of the bypass ports, compression and rebound pistons, and main piston shim stack are designed to deliver optimal progression in the damping curve based on the shock’s position and velocity. 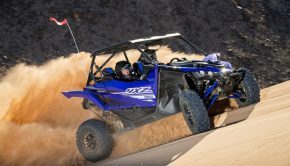 Supported by the guys from Fox Shox, Yamaha provided us with the opportunity to drive the YXZ1000R and SS Special Edition models at the Sand Hollow State Park, located in St. George, Utah. 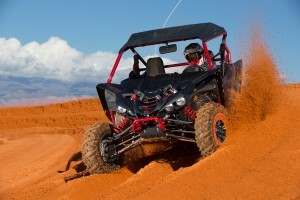 Sand Hollow provided whooped-out, desert-style trails, sand dunes, plus high and low-speed, rock sections. The stock settings are similar to what we have come to expect from the YXZ. The ride offers a good balance between bottoming resistance and small bump compliance, while doing a good job of keeping body roll in check. 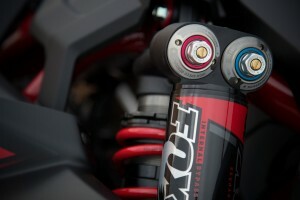 Throughout the day, we tried four different tuning settings on the Fox X2 shocks. The first was a stock setting to get a feel for the way they perform off the showroom floor. Both the front and rear shock’s high and low-speed damping settings are set two turns out with the exception of low-speed rebound damping on the rear shock, which comes set at 1.5 turns out. The rear crossover comes at 4 ¼” and the front crossovers remained in their stock position throughout the day. The stock settings are similar to what we have come to expect from the YXZ. The ride offers a good balance between bottoming resistance and small bump compliance, while doing a good job of keeping body roll in check. The second suspension settings were tuned for comfort. Up front, high and low-speed compression damping was sped up to 3.5 and four turns out respectively. Low-speed rebound was slowed to one turn out. The rear shocks’ high and low-speed compression were sped up one turn to three turns out. Low-speed rebound was sped up a half turn to two full turns out. The rear crossover was switched from 4 1/4” to 3 7.8” keeping the load on the softer tender spring longer for a slightly softer ride and less progression throughout the stroke. 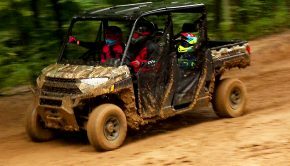 Admittedly, we left the SS press event at the Big Buck GNCC race course feeling that the YXZ could be made plush enough for long distance driving, but didn’t quite offer the level of small bump compliance as the Polaris RZR XP 1000. With the X2s tuned for comfort and enjoying a more progressive damping curve provided by the shocks’ internal bypass ports, the SE YXZ really makes small bumps disappear. This came with little trade-off in the car’s outstanding cornering manners and the shocks retained good bottoming resistance. With the X2s tuned for comfort and enjoying a more progressive damping curve provided by the shocks’ internal bypass ports, the SE YXZ really makes small bumps disappear. Traversing rocky sections at various speeds, small bump compliance seemed notably better with the X2 shocks. This came with little trade-off in the car’s outstanding cornering manners and the shocks retained good bottoming resistance as long as you didn’t hold the throttle wide open on gnarly g-outs. Out of the different settings we tried, this was our favorite for typical, every day driving where speeds and terrain often vary. The third shock setup maintained the same damping settings, tuned for comfort. However, spring preload was reduced to its minimum setting to further soften the ride. The rear crossovers remained in their softer setting of 3 7/8”. 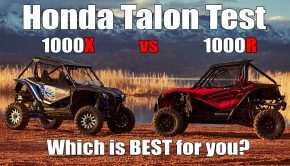 Running higher tire pressures to prevent pinch flats or punctures in the rocks in conjunction with softer spring preload results in the rear tires hopping more under acceleration in the sand, impacting ride quality and traction. Lowering tire pressure would help cure this while increasing your likelihood of getting a flat in the rocks. We’d recommend switching to a tire like the GBC Kanati Mongrel for varying dry conditions. They put more rubber on the ground in rocks and offer better floatation in sand, producing less bounce even at higher pressures. The softer preload settings on the third setup resulted in even greater comfort traversing small bumps in rocky sections of the trail. The suspension bottomed a little easier in G-outs, and framed out more easily on rock ledges. Body roll was still pretty reasonable. The softer preload settings resulted in even greater comfort traversing small bumps in rocky sections of the trail. The suspension bottomed a little easier in G-outs, and framed out more easily on rock ledges. Body roll was still pretty reasonable. This would be a great suspension setup for cruising the more clay-based, root infested trails found back East, where the YXZ’s purpose-built Maxxis tires really shine. The last setting we tried was tuned for aggressive driving. The front shock’s high and low-speed compression are somewhere between their stock and comfort settings at three turns out. High-speed rebound was left stock at two turns out and low-speed rebound was sped up from stock to one turn out. Out back, high-speed compression was left stock at two turns out while low-speed compression was slowed slightly at 1.5 turns out. 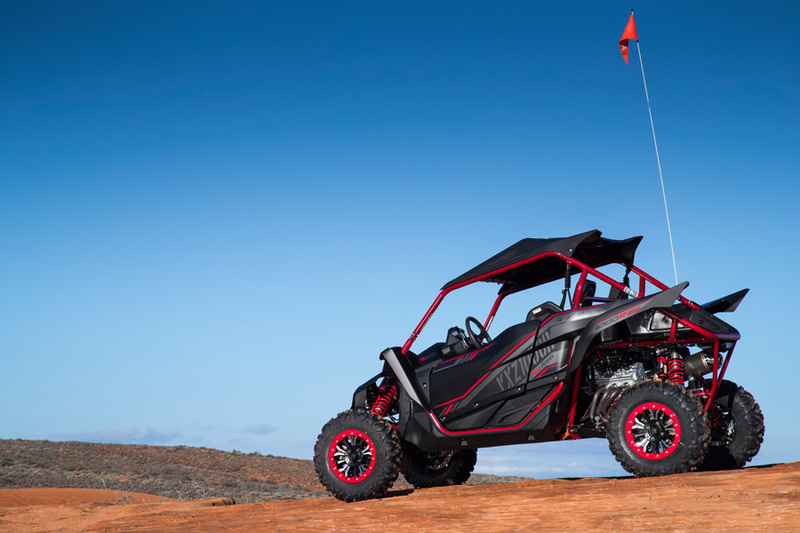 High and low-speed rebound were significantly slowed at just ½ turn out each, not a surprise considering the YXZ has a tendency to kick in whoops. The crossover was at the 3 /78” mark; again, a little softer and less progressive than stock. Spring preload was left stock at all four corners. Setup for performance the shocks sacrifices some ride comfort over small bumps, but allows you to hold a line with greater precision while pushing the limits on rough, high-speed trails. G-outs could be attacked with relative abandon with no hint of bottoming. Stability is excellent both in turns and on side-hills. Compared to the shocks being turned for comfort, the ride was dramatically different. This setup sacrifices some ride comfort over small bumps, but allows you to hold a line with greater precision while pushing the limits on rough, high-speed trails. G-outs could be attacked with relative abandon with no hint of bottoming. Stability is excellent both in turns and on side-hills. Our love for the Sport Shift system has been affirmed, deriving both the manual and Sport Shirt back to back. We never stalled the Sport Shift model, and its Dynamic Clutch Engagement let the car crawl up some pretty steep rock faces at a rather slow pace. As the day wore on and the whoops on our test loop grew deeper, the rear end started kicking up a bit, but perhaps a bit less than we’ve noticed when testing other YXZs out West. The car never started deflecting off line or doing anything scary; we just had to work the throttle to carry maximum speed on deep whoops. Perhaps adding a little more preload to the rear shocks, a firmer crossover setting, or adding a little more low-speed compression damping would help. Slowing down the rear shocks’ compression velocity may also reduce their rebound velocity helping the rear tires track better in whoops. Fox’s X2 shocks provide a wider range of usable adjustment than we could fully explore in one day of testing. Our love for the Sport Shift system has been affirmed, deriving both the manual and Sport Shirt back to back in the diverse terrain of Sand Hollow. While it doesn’t quite deliver the same level of control for experienced drivers, Sport Shift lets drivers of all skill levels relax more, which we appreciated more the longer we were in the driver’s seat. It also lets the driver better support himself with one foot planted solidly on the floorboard instead of working a clutch. We never stalled the Sport Shift model, and its Dynamic Clutch Engagement let the car crawl up some pretty steep rock faces at a rather slow pace. 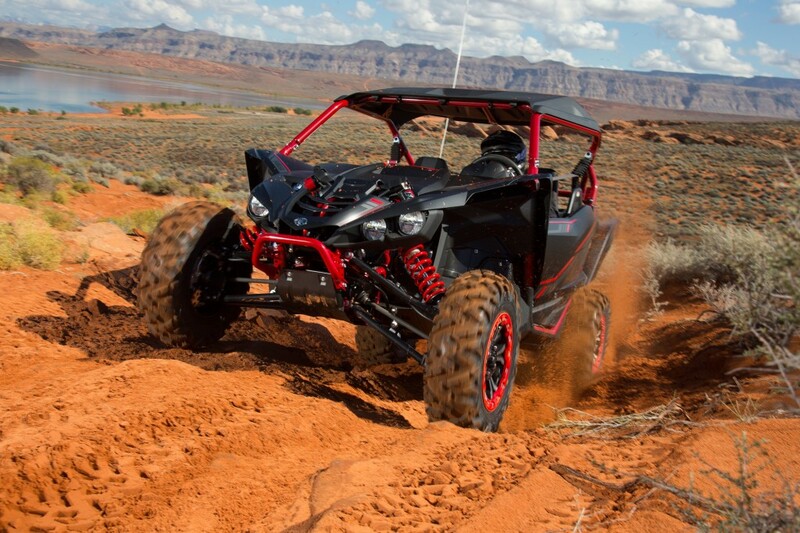 Yamaha keeps adding features to the YXZ that we can’t justify living without. For a mere $600 more than the base model, you can get the YXZ1000R Sport Shift, which we think most drivers from coast to coast will prefer. 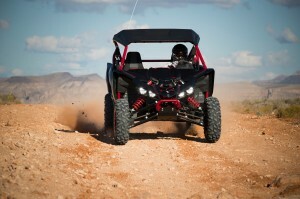 The Special Edition YXZs will set you back $1,600 more with manual shift and $1,800 more with Sport Shift. The addition of beadlock wheels and Fox Podium X2 shocks come at a modest price compared to adding these items from the aftermarket. If you like the SE’s matte black and red color scheme, that’s an added bonus. If you’re willing to take a little time setting up your shocks, Fox Podium X2 shocks improve the YSZ1000R’s suspension performance somewhat for aggressive drivers, and more dramatically for long distance trail riders where comfort is as important as handling and bottoming resistance. In our opinion, the Special Edition YXZ1000R’s added features are well worth its added price.